The British Medical Association, the Royal College of Nursing, and the Royal College of GPs publicly oppose the government's NHS reforms. A focused campaign can convince the Conservatives and Lib Dems that pressing ahead will cost them the next election. 38 Degrees aims to put up billboards in London and in key Conservative and Lib Dem constituencies. I've contributed. Now is your chance. WOW! Over 15,000 of us have donated over £200,000 so far this week. Huge billboards will be going up in 150 locations across London on Monday morning. If another 5,000 of us donate by Monday, we can take the ads to high streets across the UK. Imagine the extra pressure when billboards appear in 50 of the most marginal Lib Dem and Conservative constituencies. Not to mention those of Andrew Lansley, Nick Clegg and David Cameron! David Cameron is trying to ride it out. He knows his plans for the NHS are a disaster. But after more than a year of phoney listening exercises, aggressive spin and backroom deals, he thinks abandoning the plan now would simply be too embarrassing. But there’s one thing that politicians care about more than saving face: saving their jobs. At the moment, Cameron is gambling that it’s best to force through the changes - then hope that it doesn’t cost him too many votes later on. We can shift this calculation by proving to Cameron that the NHS is already an election issue, and a losing one for his party if they refuse to listen. Elections for the Mayor of London are fast approaching. Cameron desperately wants the Conservatives to win. Together, we can buy billboards all over the city, on the very streets where Cameron bought billboards promising the NHS would be safe with him. The adverts can warn potential Conservative voters that most doctors and nurses think the changes will make our NHS worse. Sometimes 38 Degrees members come together to pay for things which otherwise only big companies and political parties can afford. Earlier thousands of us chipped in to hire a crack legal team: their report made the front page of The Observer. This helped force Lansley to back away from plans to scrap his legal duty to provide our health service. 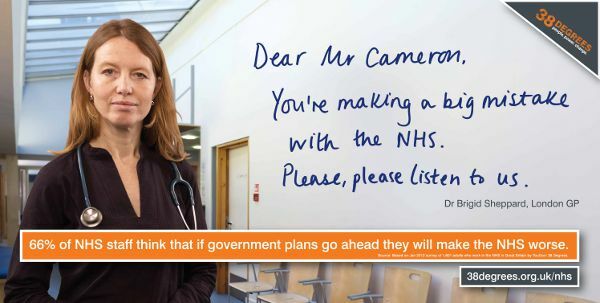 Now we can take one big, bold message to the voters Cameron cares about most. Would love to, but I'm saving up towards a shiny new haskell tag for your best blog posts.